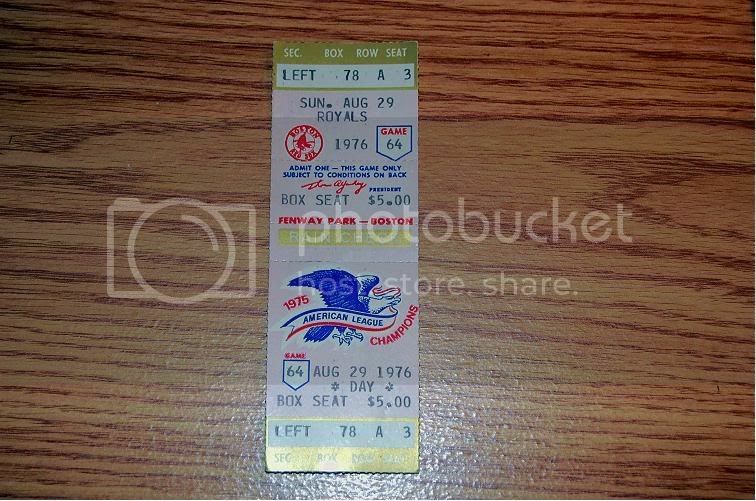 I recently found an old Red Sox ticket stub of mine. Today a front row box seat at Fenway is about $200.00 ! Check out the price back then! Re: Red Sox ticket ! I love finding old little things that dig up memories. Good Stuff Jay! cgrand,thanks for the box score! One thing it didn't mention....I caught 2 foul balls that day! One off Amos Otis and one off Carlton Fisk! I've caught over 40 fouls at Fenway thru the years. Those seats are where the 3rd base ball boy/girl sits now. The wall that juts out just beyond the 3rd base dugout. that's all I would pay now a days for that. How much for the ticket stub? Seeing Tom Yawkey's signature bring back memories of Yaz. They are having a day for him at Fenway this year. He is an accomplished stripper fisherman, by the way. Last edited by evensen; 07-15-2009 at 08:45 PM. I hear they like shiny poles and are most active whe it is "raining". That seat is a buck and a quarter now. View Next Unread Bored Teenagers..........Not Always a Bad Thing! !